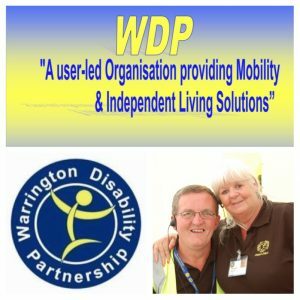 I was a Trustee on the Board of Warrington Disability Partnership for five years until May 2017, and like most who are touched by this charity am constantly amazed at how it delivers for disabled people and their families across a big range of service provision, advice & guidance, and with its hugely successful retail arm, The Disability Trading Company. What does WDP do ? Well its almost easier to say what they don’t do !! Contract delivery includes Employment support / job seeking brokerage for those facing sometimes multiple barriers to work and the success of this team is impressive. The Direct Payments team are an integral part of the landscape in the area for those employing Personal Assistants under LA provision, and WDP’s much respected Payroll Service is a very popular aspect of this work. Independent Living is strongly supported in most aspects of what WDP does and the Disability Trading Company (part of WDP) is incredibly successful in offering retail sales of a massive range of disability related goods from walking sticks to electric recliner chairs, stairlift supply, powered and manual wheelchairs (for sale and hire) and lots, lots, more from three locations (two in Warrington and one in Liverpool) OH….and on top of all this WDP has an impressive Learning Centre which amongst other things offers computer training for the terrified !! 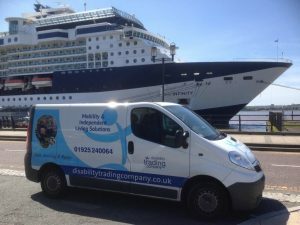 Organising the hire of a wheelchair for a passenger on a cruise liner, all part of the DTC service !! 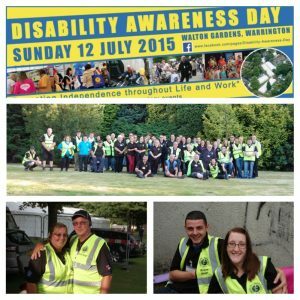 Of course WDP is perhaps best known for creating and organising the UK’s biggest pan disability awareness day – or “DAD” as it is known locally….well everywhere ! 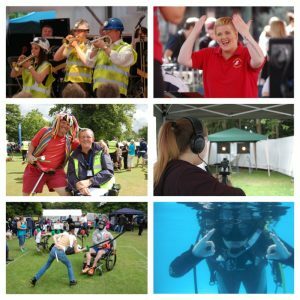 Disability Awareness Day at Walton Hall Gardens in Warrington is just an incredible day, with 20,000 to 25,000 visitors on the day, its been going for 25 years and in 2017 the 26th DAD will again offer the visitor a vast array of information stands (250 exhibitors) quality entertainment, product sales, lots of food and too much else to mention. And there’s more !!! DAD may be one the biggest events of its type anywhere but there is also “DAD Week” which is made up of the brilliant launch event 8 days prior to the show itself, then a full week of events in the park. It really is a week not to be missed. Disability Awareness Day only happens thanks to the DAD’s army of volunteers !! ps they all work very hard and sometimes need a rest ! 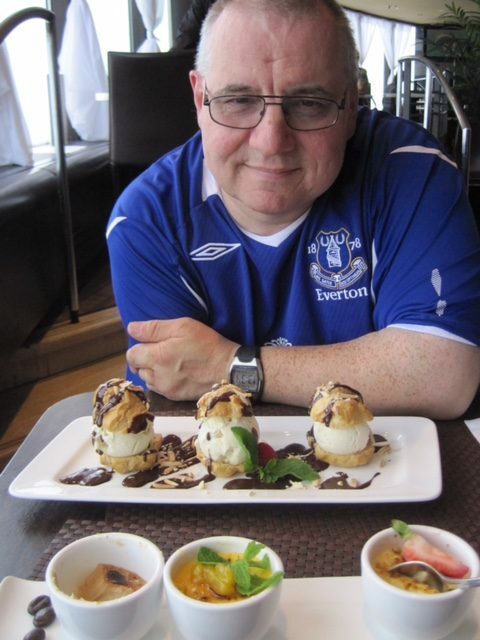 DAD is the perfect example of accessible volunteering. 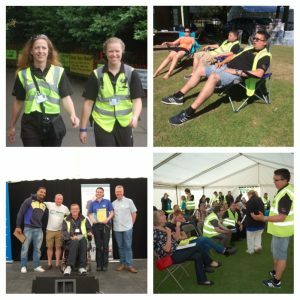 WDP has a big network of volunteers and if you are looking for a big choice of volunteering opportunities then this is the place. WDP welcomes volunteers of all ages, all abilities and of course disability is never a barrier to making your contribution at WDP. Theres a lot of other stuff going at this leading edge charity across the Warrington area and sometimes far beyond. The Phoenix recycling scheme takes you from Warrington to Egypt with its amazing mission. 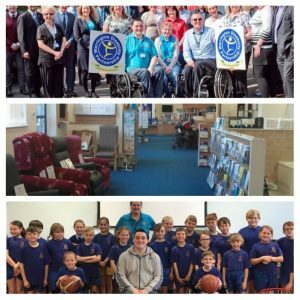 The Chief Executive and co founder Dave Thompson is a hugely respected and experienced senior leader in the world of disability , both locally and nationally. Theres a lot more to say and the WDP website will explain it all. This genuinely is Volunteering at its liveliest and I can only recommend you get in touch with WDP if you want to contribute your experience and skills to this great organisation.